Ozhotels provides business and leisure travellers with a directory of independently owned and non-related hotels and serviced apartments providing accommodation in St Kilda, Melbourne. Oz hotels allows you to deal directly with the hotels and apartments in the beach side suburb of St Kilda, hence giving you the best possible rates for this luxury and budget St Kilda accommodation. Book your accommodation online directly with the hotels in St Kilda, Melbourne and receive discount rates for longer stays !!! St Kilda is located on Port Phillip Bay about 6kms south of the Melbourne CBD. St Kilda has been a popular seaside accommodation destination for both local residents and holiday makers for many years now. During the early years St Kilda was favoured by Melbourne's elite and this is represented in the many palatial mansions and historic buildings still seen today throughout the suburb. 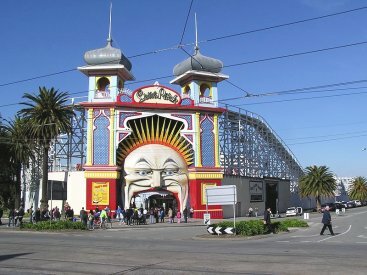 In recent years, St Kilda has shaken off the reputation as Melbourne's red-light district and has become home to many of Melbourne's famous tourist attractions including Luna Park, the St Kilda Sea Baths, Esplanade Hotel, Acland Street and Fitzroy Street. St Kilda has a vibrant local music scene with prominent local music venues including the Palais theatre, the Esplanade Hotel and the Prince of Wales Hotel. St Kilda is also the home of many theatres and there are a number of public artworks on display. The St Kilda Esplanade features an arts and craft market every Sunday and the entire foreshore area is home to the larger than life St Kilda Festival which is held around February every year. St Kilda Beach is a beach with gentle bay waves that is popular with swimmers and sunbathers during the summer months, whilst Acland Street is a shopping and restaurant precinct that is famous for its cake shops, fine restaurants and cafes. With an edgy, boutique interior and an enviable St Kilda road location, close to trendy cafes, bars and restaurants and just a stones throw from the Melbourne CBD, The Blackman Hotel is a unique 5 star luxury hotel, perfect for business or leisure travellers. The Blackman in St Kilda Road is close to everything that the city has to offer, as well as having a numerous guests facilities and services including business centre, conference centre, direct internet access, disabled facilities, guest laundry, gym & fitness equipment, lift, restaurant, room service, tour desk, airport shuttle and 24 hour reception. 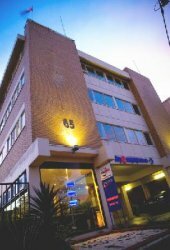 The Blackman Hotel also specialising in catering for corporate business clients with WI FI internet connection in all suites and apartments, a business centre, faxing facilities and inspiring conference/meeting facilities. A destination perfect for the business or leisure traveller, The Blackman Hotel offers guests a blend of exclusive five-star accommodation, hospitality and first class facilities in a very convenient St Kilda Road, Melbourne location. The Redan Apartments Melbourne provides guests with budget serviced studio apartments ideally located in a quiet tree lined street in East St Kilda. Ideally positioned just 4kms from the Melbourne CBD, the Redan Apartments are within easy reach of the many business, sporting and cultural venues. 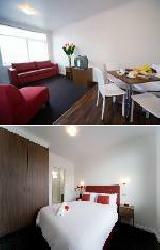 The Redan Apartments provides all types of travellers with discount accommodation in St Kilda. It also features a wide range of modern amenities and services such as direct internet access, free car parking, guest laundry, tour desk, airport shuttle, baby cots available and daily housekeeping. A short drive or tram ride will take you to the Melbourne CBD, St Kilda Road business district and the famous cosmopolitan Southbank district. The Redan Apartments St Kilda has a range of quality studio apartment accommodation available at very affordable prices, making it ideal for the budget concious business or leisure traveller. The Quest Bayside Apartments has a strong appeal with corporate guests, leisure travellers and families because it provides quality St Kilda accommodation with a delightful home away from home feeling. The fully self contained studio, 1 & 2 bedroom apartments at the Quest Bayside are located in a quiet residential street yet only minutes walk from the cosmopolitan attractions of St Kilda, including the beach, Luna Park, Acland Street and Fitzroy Street. 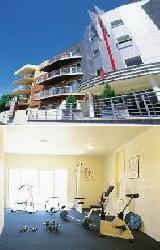 The Quest Bayside is a quality alternative to traditional St Kilda accommodation. All apartments have been recently refurbished the property also includes a heated outdoor swimming pool during summer, in-house DVD hire, well equipped gymnasium and BBQ facilities. Quest St Kilda Bayside is ideally located to easily access the Melbourne CBD as well as Melbourne's premier attractions and places of interest. 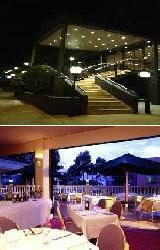 The Crest on Barkly Hotel provides fantastic hotel accommodation in St Kilda at reasonable rates. This quality St Kilda accommodation also boasts easy access to St Kilda's famous Luna Park, Albert Park Lake, St Kilda beach and the restaurants and bars along Fitzroy Street. Guests staying at the Crest on Barkly Hotel St Kilda can catch a tram on the doorstep to the Melbourne city to visit the Royal Botanical Gardens, Shrine of Remembrance, Federation Square, Victorian Arts Centre, Southgate and Crown Casino. 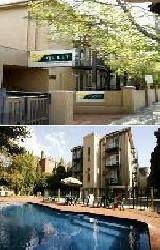 There is also free on site car parking available at the Crest on Barkly Hotel St Kilda. The Rydges is an ideal luxury accommodation for corporate and leisure travellers alike, located just a short stroll to the beach and bayside attractions, as well as being surrounded by a variety restaurants, cafes, boutique retailers and nightlife entertainment. This luxury designer hotel offers a unique St Kilda accommodation experience complete with complimentary access to St Kilda Sea baths at the South Pacific Health Club. The Rydges St Kilda offers guests contemporary designer furnishings, fittings and art throughout the property. 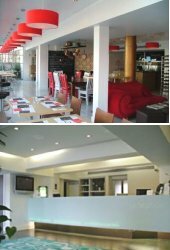 There is even a stylish suger Cafe & Curious Restaurant which is ideal for post work drinks or weekend celebrations. With 4 great room types and a host of quality hotel facilities come on over and see for yourself what defines the Urban St Kilda accommodation experience. Situated only 3½ kms from Melbourne city centre the Park Regis Griffin Apartments provides comfortable and extremely spacious hotel rooms, one bedroom apartments and two bedroom apartments that are suitable for both corporate and holiday travellers. Guests staying in this luxury St Kilda accommodation can walk to Albert Park Lake or catch a tram to St Kilda beach, South Yarra shopping, Melbourne Botanical Gardens, Victorian Arts Centre, MCG, Federation Square and the Melbourne city centre. The Mantra Apartments offers studio & 1 bedroom self contained apartments that are located on the famous boulevard of St Kilda Road, making them ideal for business or pleasure. The Mantra Apartments in St Kilda are only minutes to the Melbourne CBD, Southbank and the famed shopping precinct of Chapel Street in South Yarra. The property has many guest facilities including guest laundry, gym, lift, room service, 24 hour reception, baby cots for hire, daily housekeeping and express check in/out. The Mantra Serviced Apartments caters for business corporate travellers with WiFi internet connection in all apartments, faxing facilities and secretarial services. With the convenience of Melbourne's tram network right outside your doorstep, the Mantra St Kilda is a great place to stay. At the Stanton Apartments in St Kilda there is a selection of spacious 2 and 3 bedroom serviced apartments, all positioned on the leafy St Kilda Road. There are numerous trams running right past the front door of the Stanton Apartments St Kilda which will take you into the city centre in 10 minutes. Corporate executives and families staying at this spacious St Kilda accommodation can make the most of the hotel facilities which include free on site car parking, an indoor swimming pool, sauna, spa, BBQ area and gymnasium. The tranquil surroundings of Albert Park Lake and the culinary delights of Fitzroy Street are also within walking distance of the Stanton Apartments in St Kilda. 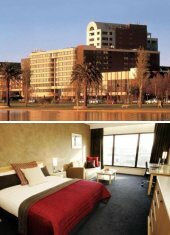 The Sebel Albert Park Hotel St Kilda provides both business and holiday travellers to Melbourne with luxury hotel rooms and hotel suites overlooking the beautiful Albert Park Lake, Albert Park gold course and the Formula 1 Grand Prix Track. This luxury St Kilda accommodation is perfectly located on Queens Road just minutes walk from the St Kilda Road business precinct, numerous restaurants, cafes and bars on St Kilda's Fitzroy Street and only a short tram ride away from the Melbourne city centre and the Royal Botanic Gardens. The Sebel Albert Park Hotel St Kilda has been recognised as one of Melbourne's longest standing and successful conference, meeting and event venues. The quality St Kilda hotel accommodation provided by the Mercure Melbourne Albert Park is centrally located on Queens Road and overlooks the spectacular Albert Park Lake which hosts the Australian Formula One Grand Prix every year in March. This St Kilda accommodation is positioned close to the business precinct of St Kilda Road and just minutes via tram from the Melbourne CBD, Chapel Street shops and the beaches, restaurants, cafes and bars on Fitzroy and Acland Streets in St Kilda. 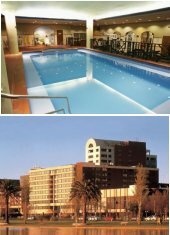 The hotel facilities at the Citigate Hotel Albert Park include a fully equipped gymnasium, indoor heated swimming pool, spa, sauna and an all weather tennis courts located adjacent to this St Kilda accommodation. Catering to both the corporate and leisure traveller, Quest East St Kilda is superbly located close to public transport, Luna Park, Albert Park, markets and the cosmopolitan shops and restaurants of Carlisle and Chapel Streets. It is ideally set on acres of landscaped gardens and offers quiet and secluded hotel and apartment accommodation in East St Kilda. All guest accommodation rooms are spacious, modern and fully refurbished, allowing guests to relax in comfort and privacy. Guests have access to the indoor heated pool, spa, resturant, valet laundry service, restaurant chargeback, wireless internet access, tour desk, lift, complimentary newspapers, airport shuttle and free undercover car parking. 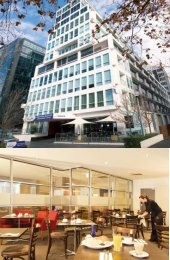 Quest East St Kilda also specialises in catering for corporate guests with a range of business and secretarial services available. The Easystay Apartments Raglan Street offer families and travellers an affordable One Bedroom Apartment with full kitchen facilities in fabulous St Kilda East. 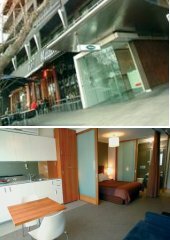 Easystay Apartments Raglan Street are located close to the cosmopolitan shops and restaurants of Chapel Street, Acland Street precinct, Luna Park, Albert Park and St Kilda Beach. The Easystay Apartments Raglan Street in St Kilda is close to everything that the city has to offer, as well as having a numerous guests facilities and services including direct internet access, faxing facilities, guest laundry, tour desk and car parking. Easystay Apartments on Raglan Street provides self contained apartments in a fabulous Melbourne location at an affordable price. The Cosmopolitan Boutique Hotel is a fully refurbsihed luxury 4 star accommodation hotel located in the heart of St Kilda. 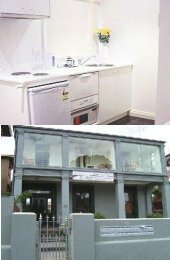 This modern and contemporary St Kilda accommodation is ideally positioned within easy walking distance of all St Kilda's famous attractions including the restaurants, cafes, shops and nightlife of cosmopolitan Acland and Fitzroy Streets, Luna Park, St Kilda Sea Baths and the famous St Kilda beach. Guests staying at the Cosmopolitan Hotel St Kilda also have easy access to the Melbourne city centre, MCG, Telstra Dome, Rod Laver Tennis Arena and Melbourne Sports and Aquatic Centre via Melbourne's world famous tram network. 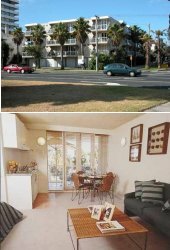 Providing quality studio apartment accommodation in St Kilda the Beaconsfield Beach Apartments are both spacious and extremely well appointed. This comfortable and affordable St Kilda accommodation is perfectly situated near the St Kilda foreshore and St Kilda beach as well as being only a few minutes walk from public transport and the shops, cafes, restaurants and cake shops of Acland Street & Fitzroy Street. The Melbourne CBD is easily accessible from this fantastic St Kilda accommodation making it ideal for both long or short term stays. 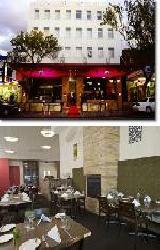 The Quest on St Kilda Road is located on the fringe of the Melbourne CBD in the picturesque suburb of St Kilda. It provides spacious accommodation in your choice of 1 or 2 bedroom serviced, fully self contained apartments, which are conveniently located within a few minutes walk to the St Kilda Road Business District and the award winning restaurants, cafes and fashionable boutiques of cosmopolitan Fitzroy Street and Acland Street. Also the Melbourne Sports & Aquatic Centre and Albert Park Lake are just around the corner. Quest on St Kilda Road is perfect for business or leisure accommodation offering a quality alternative to traditional hotel rooms. The property is built around a central courtyard of 4 floors with lift access and guests have the choice of a One Bedroom Apartments, Two Bedroom Apartments, Two Bedroom Deluxe Apartments or Two Bedroom Executive Apartments. Quest on St Kilda Road also provides a range of guest facilities and services including a well equipped gym, sauna and steam room, courtyard garden area, daily housekeeping, 24 hours management, DVD movies hire, secure building access, restaurant charge back and delivery, valet laundry, tour desk, baby sitting services, airport transfers, secure underground car parking and complimentary newspapers. 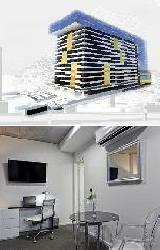 Providing comfortable and convenient studio apartment accommodation in St Kilda the Sixty Two on Grey Street Apartments occupies a lovely position in vibrant St Kilda. 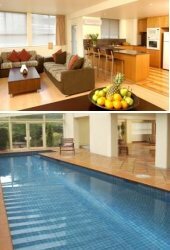 This 4 star St Kilda accommodation is perfect for both short and longer term visits to Melbourne. A variety of restaurants, cafes, boutique shopping and entertainment venues are located nearby to the Sixty Two On Grey Street Apartments St Kilda. 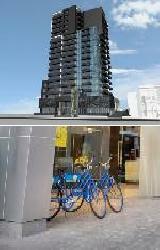 Apartments INK is St Kilda's newest apartment hotel located just near the corner of Inkerman Street and St Kilda Road. This St Kilda accommodation is idealy located just a short walk to everything that St Kilda has to offer and is close to neighbouring Albert Park, the home of the Formula 1 Grand Prix. The business districts of St Kilda Road and the Melbourne city centre are also only a short tram ride away from this St Kilda accommodation. At Apartments Ink St Kilda there is a mix of hotel rooms and fully self contained apartments of various sizes, configurations and prices to suit every budget. Everything at Apartments Ink is new including the building, furniture, fittings and appliances which helps to make this St Kilda accommodation a very comfortable and relaxed destination. 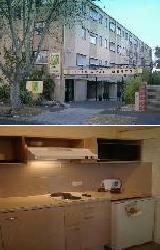 The Easystay Motel is a budget priced motel that provides cheap St Kilda accommodation in the heart of Fitzroy Street. This budget St Kilda accommodation is located an easy distance to the Melbourne city centre via the tram on the doorstep as well as being walking distance to St Kilda beach, restaurants, bars, nightlife entertainment, Luna Park, Albert Park Lake and the Melbourne Sports & Aquatic Centre. 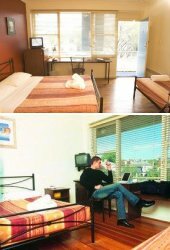 The Easystay Bayside is an affordable motor inn in St Kilda that has comfortable rooms to make you feel right at home and also offers great value St Kilda accommodation for the very budget conscious traveller. The Easystay Serviced Apartments is located in various locations around St Kilda including Acland Street, Raglan Street, Carlisle Street and Blessington Street. Holiday makers and business travellers can choose from a variety of styles of cheap apartment accommodation depending on their needs and budget. The Easystay Apartments St Kilda has comfortable and affordable studio apartments through to spacious family sized apartments. No matter which of these St Kilda accommodation options you choose you will still be only walking distance to the restaurants, cafes and bars along Fitzroy and Acland Streetsas well as the foreshore of St Kilda beach and public transport into the Melbourne CBD. 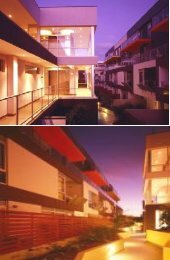 The Medina Apartments St Kilda provides luxury apartment accommodation for guests who are travelling to Melbourne on corporate business, visiting friends or simply on holidays. The Medina Apartments in St Kilda provides the ideal place to stay beacause of it's easy access to shops, restaurants, nightlife entertainmentand the Melbourne CBD. The Medina Apartments have all the facilities that a traveller would expect from a luxury 4.5 star St Kilda accommodation including a 24 hour reception, gymnasium, in-room massage, room service and babysitting service.